Hi! I’m Ealasaid A. Haas. Tech writer by day, bookbinder by night, movie reviewer on the weekends. 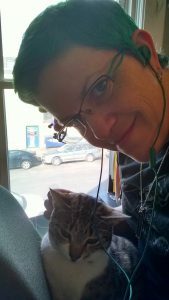 If you’re looking for a slightly longer blurb: I grew up in the SF Bay Area, attended Occidental College and Stanford University, and I live in Portland, OR with my partner and four cats. These days (early 2016) I mostly work as a technical writer while doing bookbinding and book repair and movie reviews.